1. What is Windows 8 ? Windows 8 is the next version of Windows for desktop, laptops and tablet computers. It will eventually replace Windows 7. 2. 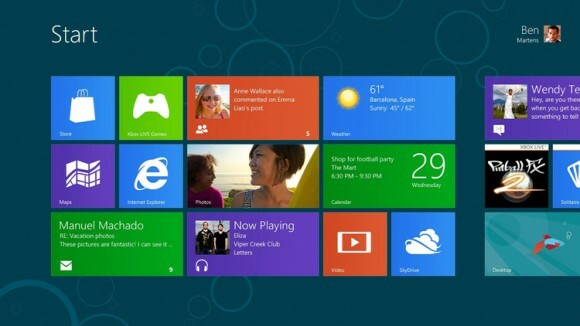 What is new in Windows 8? There are several major changes to Windows 8 compared to Windows 7.
a) New Metro style interface to replace the old fashioned Explorer desktop using big icons like on Windows Phone. b) Support for Touch Screens and gesture controls incl swipe, press, slide, rotate, pinch and tap. c) No old fashioned start menu. d) New touch keyboard to use with touch screens. e) Updated windows apps including Mail, Photos and Messaging and download new ones from the Windows Store. f) Compatibile with existing hardware as well as touch-base devices. g) Updated Internet Explorer 10 with Metro style interface. h) Support for different APIs including HTML5, .NET Framework, Silverlight and new Windows Runtime (WinRT). i) Hyper-V support for 32 bit and 64 bit clients, on some editions of Windows 8. 3. Where can I get Windows 8 from? You can buy Windows 8 from your PC stockist or eBay. The full retail version will be released on October 26, 2012. 4. Will my existing hardware and software work on Windows 8? within the last 3-5 years should work fine. DirectX 9 capable graphics card with a WDDM driver. More information is here. 5. What MultiTouch capable monitors and pads are there? * Ilyma Touch Screen Monitors. 6. Can you run Windows 8 on non-Intel/AMD processors? Yes, Windows 8 will run on ARM processors. ARM processors can be found on smaller mobile devices such as Smart Phones, Apple iPad, Asus Epad Transformer, Apple iPod, Nintendo DS and the TomTom. 7. Can I get replacement Start Menu utilities? Yes, there are a few tools around including Vista Start Menu, StockDock menu, Start Menu 7, and Vistart. 8. If I run it in VirtualBox, I cannot install the VBox Additions? You can install the additions as long as you disable the Driver Signing checks first using BCDEDIT.exe tool in the command prompt. See Windows 8 Hardware page on how to turn it off. 9. What settings are need to run Windows 8 in Virtual Box? * Hard Disk: 20 GB or more or use dynamic storage. * Display. Video Memory: At least 128 MB. 2D Acceleration and 3D support. * System. Chipset: ICH9. Features: IO APIC. Acceleraton: VT-x/AMD-V, Nested Paging. Processor: PAE/NX. 10. Is there a Windows Server 2012 (R2) version out? Yes, you can try out the evaluation version of Windows Server 2012 from Microsoft. 11. How do I add a program to the new Metro start menu screen? Press the Windows key and F key to load the search screen. Enter the program's name in the search box and select 'Apps' for the type of files to search (does not press Enter otherwise it will start the program immediately). A list of applications will be listed on the left side. Right click the application and at the bottom click on 'Pin to Start' to add it to the menu. You can also select 'Pin to taskbar' to add it to the taskbar area on the desktop. 12. I cannot find my program on the Start menu, how can I start it? a) Press the Windows key and the F key to load the search screen (or click the minus sign at the bottom right of the screen and select Search from the pop up menu). Enter the program's name in the search box and select 'Apps' for the type of files to search, press Enter to start the Program. b) Press the Windows key and the R key to bring up the Run dialog box, and enter the name of the program or enter the path of the program and click on OK (use the Browse button to locate the program). c) Press the Windows button to switch to the desktop, right click the desktop, select New Shortcut and enter the path and name of the program to add an icon to the program on the desktop. d) To access the folder where the program shortcuts are, you can create a shortcut to c:\ProgramData\Microsoft\Windows\Start Menu. e) Press the Windows key and the X key to bring up the power or admin menu for qucikly accessing administrative tools such as Command Prompt, Run, Computer Management, Event Viewer, Programs and Features. 13. How do I access Settings and the Control panel? To access Windows 8 settings, press Windows key and the C key to view general Windows 8 settings (or click the minus sign at the bottom right of the screen and select Settings from the pop up menu). To access the Control Panel, select the Desktop option on the start menu, open the Folder window from the taskbar (at the bottom left), then select Computer, then on the ribbon select Open Control Panel. On the ribbon there are also links to 'Uninstall or change a program', Manage (your computer) and the System Properties. 14. How do I logout, restart or shutdown my computer? a) Click on your account name at the top right of the start screen and select Sign Out. You can restart or shutdown when you have signed out by clicking on the Power icon at the bottom right. b) Press the Ctrl + Alt and Delete keys together. Then you will get options to Lock the workstation, Switch to another user, Sign out (or logout) or load the Task Manager. If you click on the Power icon at the bottom right, you will get the option to Shutdown, to do an emergency restart, press the Ctrl key and then click the Power icon.